Barren fields and shallow desert valleys create howling winds and dusty vistas near Kayenta, Arizona. One can stand amid the sparse vegetation and feel totally isolated by the modern world, removed from the very fabric of time. 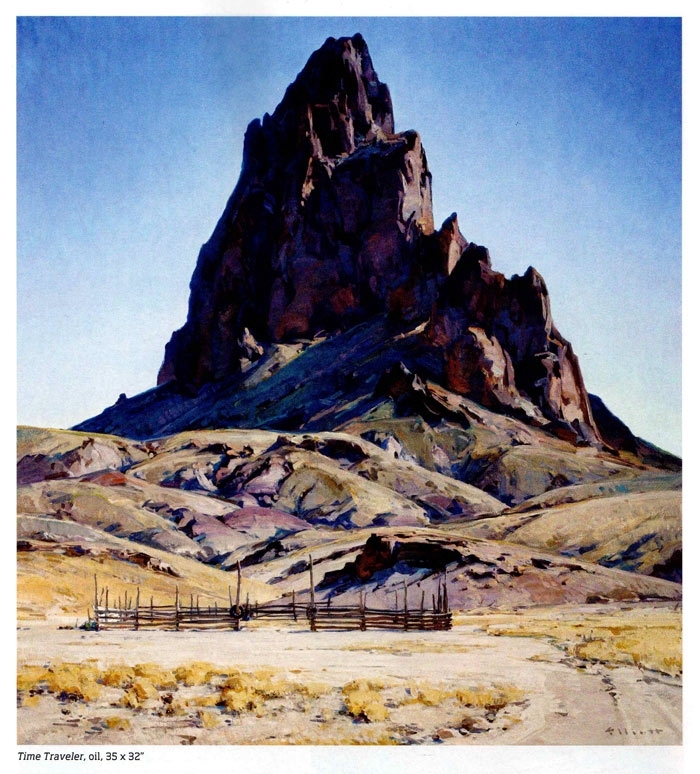 Seven miles north of Kayenta stands Agathla Peak, a shark tooth of rock that bites 1,400 feet through the sandy desert soil. The peak was formed by igneous rock that settled in the cone of a volcano, and then the elements eroded away the volcano itself leaving Agathla, a plug of exposed earth, towering over the sage. The process was not quick – it took 25 million years. Time is what formed it, and time is what has brought Josh Elliott to its base. In his Time Traveler, the Montana artist paints Agathla cutting high into the sky with a simple horse or sheep corral in the foreground. On a wooden post hangs an old tire, the final key element to a trilogy of time markers: the millions—year-old rocks, the century—old corral and the decades- old car tire. This is the land of the ancients, decorated by the people of today. 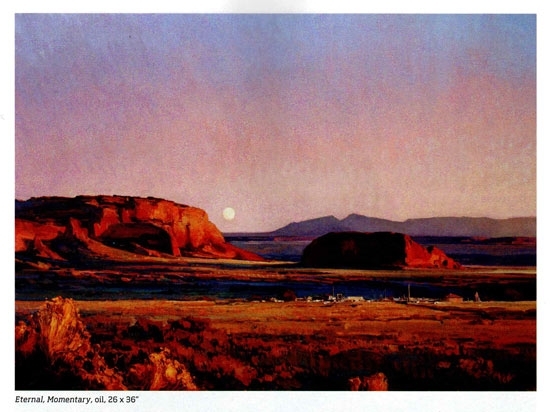 Elliott will be presenting his new desert paintings—landscapes near Kayenta, Canyon de Chelly, Tucson and other locations in Arizona and the Southwest—in Desert Time Travels, his solo exhibition at Mark Sublette Medicine Man Gallery in Tucson, Arizona. The show opens March 9 with an artist reception from 5 to 7 p.m., and then continues through April 27. 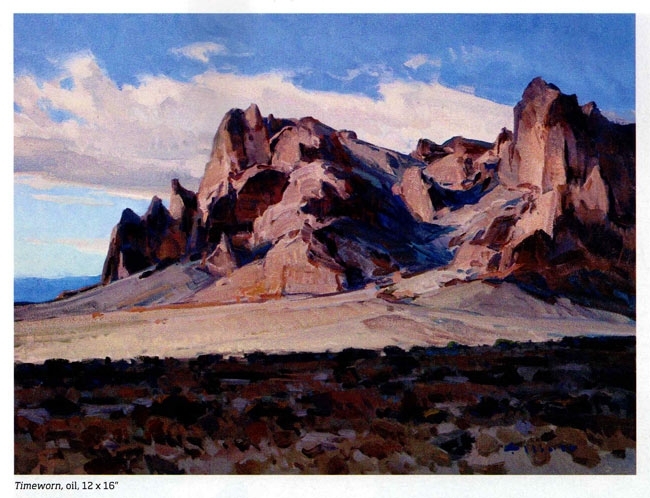 In addition to major Arizona landmarks, the exhibition will feature landscapes from around Shiprock and Toadlena, New Mexico, both important destinations to the Navajo people. 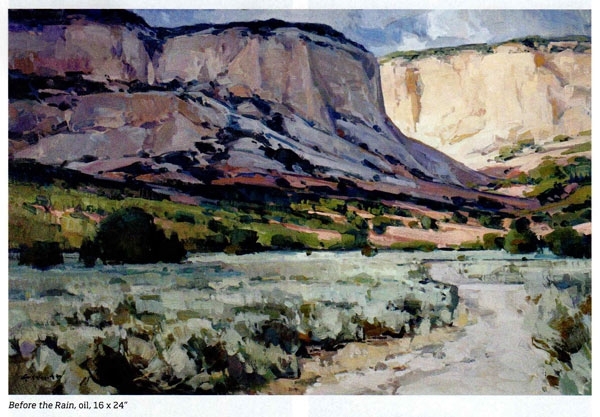 Elliott, whose work has been featured at major exhibitions around the country, including at the Prix de West at the National Cowboy & Western Heritage Museum and the Quest for the West at the Eiteljorg Museum, says he strives continuously to offer unique views of the land and its features. The process can be daunting.